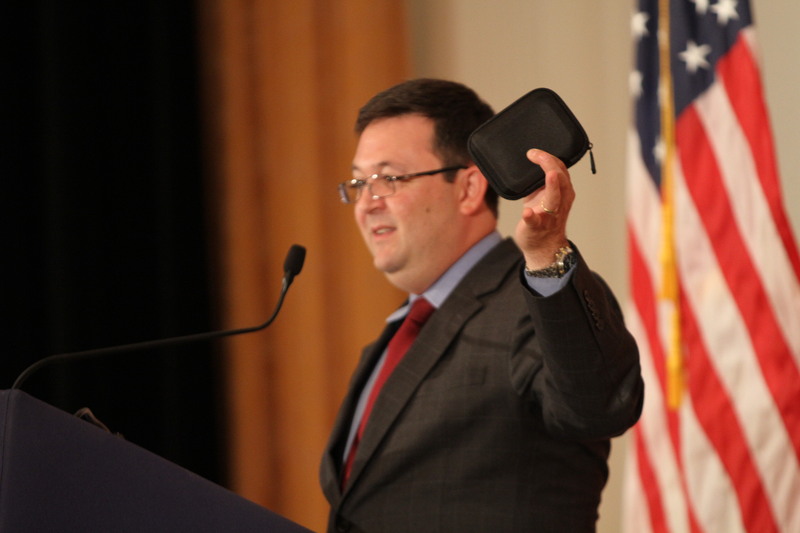 Naval War College Professor Richard Moss holds up a hard drive which contains all available 2,600 plus hours of audio from the Nixon White House taping system. 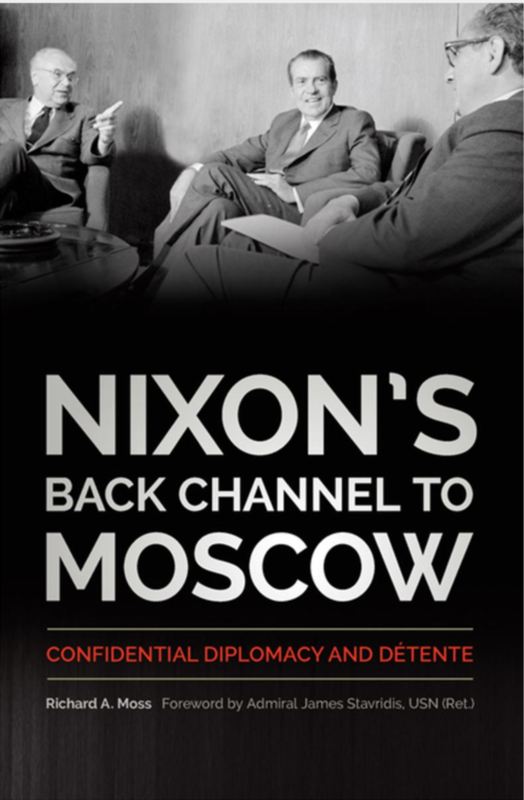 Historian Richard Moss talked to a Nixon Library audience about how President Nixon and National Security Advisor Henry Kissinger effectively created a back channel to conduct high-stakes diplomacy with the Soviet Union. The presentation makes use of primary sources from the Nixon Presidential Library, including audio from the White House taping system. – The importance of back channels as a tool in a diplomatic tool kit. – How Nixon and Kissinger used back channels in their most important diplomatic initiatives, including rapprochement with China and the Moscow Summit in 1972. – How back channels were used to diffuse a second potential Cuban Missile Crisis in 1970. – Why back channels appealed to U.S. and Soviet leaders. – How back channels protected against leaks. – How back channels become a safety valve to express tensions between powers. – How back channels allow diplomats to bargain and make tradeoffs. – How back channels can ‘personalize’ and enhance diplomatic relationships. – How back channels can become a weapon in bureaucratic warfare. – How Henry Kissinger attempted to create back channel with the Soviet Union for Vietnam peace in 1967. Lawrence Eagleburger to Henry Kissinger “The problem of contacts in the Soviet Embassy,” January 1969. Box 66, Henry Kissinger Office Files, National Security Council Files, Richard Nixon Presidential Library. Minutes of Review Group Meeting on Sino-Soviet Differences. 20 November 1969. Box H-111, Institutional Files (H-Files), National Security Council Files, Richard Nixon presidential Library. Brezhnev Letter to President Nixon, 7 September 1971. Box 497, President’s Trip Files, Volume 2, National Security Council Files, Richard Nixon Presidential Library. Memorandum of Conversation Between Richard Nixon and Andrei Gromyko, 29 September 1971. Box 492, President’s Tip Files, National Security Council Files, Richard Nixon Presidential Library. Telcon Between Richard Nixon and Henry Kissinger, 29 February 1972. Telephone Conversation 20-126, Box 29, Kissinger Telcons, Richard Nixon Presidential Library. Memorandum from William Rogers to Richard Nixon, 16 May 1972. Box 476, President’s Trip Files, National Security Council Files, Richard Nixon Presidential Library. “Donald Trump is wrong. When Democrats were offered secret help by the Soviets they refused,” Washington Post Monkey Cage, 13 July, 2017. “This is why presidents want back channels and how it can go wrong,” Washington Post Monkey Cage, 27 May 2017. With Luke Nichter, “This is why Richard Nixon Tapes His Conversations,” Washington Post Monkey Cage, 15 May 2017. “Why Back Channels with Russia cost Michael Flynn his job,” Washington Post Monkey Cage, 14 February 2017. “Trump may be borrowing Nixon’s ‘back channel’ strategy in his contacts with Russia,” Washington Post Monkey Cage, 16 December 2016.